Hideaway in an ocean facing sanctuary that offers incredible privacy, a generous 300 square meters of charming space, and a House Master on hand 24 hours a day to take care of every need. 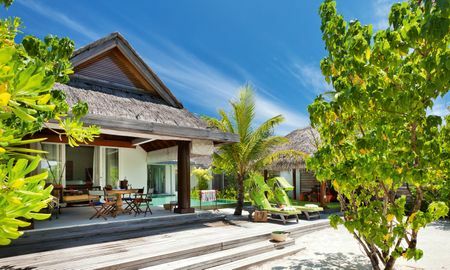 Watch the waves roll in as you bask under the sun on loungers that are set on a spacious hardwood deck extending out over the Indian Ocean. 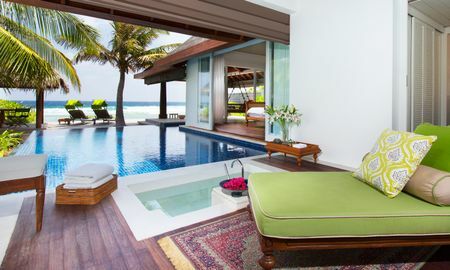 A white sandy beach and turquoise lagoon are just steps away, made even more tempting by your very own beach cabana. Relax in your villa’s beautiful interior, characterised by elegant hardwood furnishings, classic design and natural tones. Refresh under the waterfall shower after a session in your personal steam room. Dip into your private 35 square meter pool that features ocean inspired aqua tiles, and indulge in a soak in the separate sunken tub. 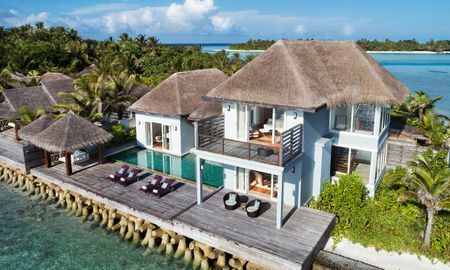 The elegance of Naladhu begins with a scenic 35-minute speedboat ride along the Malé coastline and the turquoise waters of the Indian Ocean, to a private island 21 km south of Velana International Airport. On arrival at the airport, a representative will welcome the guests and guide them to the Lounge and the comfortable speedboats. For your arrival in the best conditions, please give us the details of your arrival and departure flights at least 5 days before your arrival to Male by email at reservations@prestigia.com.